Boxing fans in the Tuna Capital of the Philippines, General Santos City, were treated to an exciting 11-bout boxing show at Robinsons Place Gensan to celebrate the birthday of the city's popular top promoter Jim Claude "JC" Manangquil. In the main event, Gensan super bantamweight Mike "Magic" Plania (17-1, 10 KO's) of the Sanman Boxing Gym came out with guns blazing against unheralded Bukidnon's native Renen Portes (10-9, 6 KO's), pinning him against the ropes, ravaging him with damaging blows to the head and the mid-section that forced the brave Portes down to the blue canvas where he capitulated at 2:26 mark in round one. Portes was seven pounds heavier and a couple inches taller than Plania, but that did not matter at all as the "Magic Man" did not allow Portes to dish out any offense. 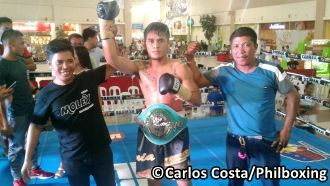 It was a quick victory for the 21 year-old Plania whose WBC Asia Silver title was not on the line. The third man was the experienced Sir Alberto Heramil of Davao. 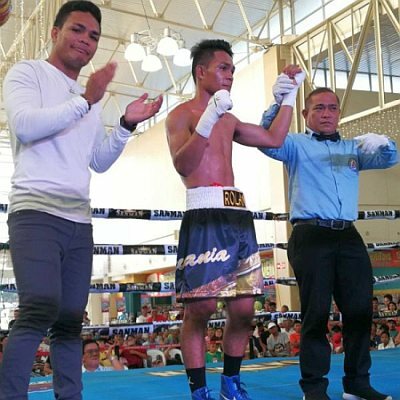 After almost five years away from boxing, unbeaten bantamweight Rolando Servania (7-0, 3 KO's), younger brother of world-rated Top Rank fighter Genesis Servania, came back to fighting action scoring a devastating round one knock out victory over less-skilled Wiljan Ugbaniel (13-11-1, 4 KO's) of Sarangani. Roland Servania (C) wins as brother Genesis Servania (L) applauds. Despite the long hiatus from combat, the tall Bacolod native looked sharp and accurate landing mercilessly and confidently over his foe Ugbaniel who could not handle the punishment, succumbing at the 1:15 mark in round one. 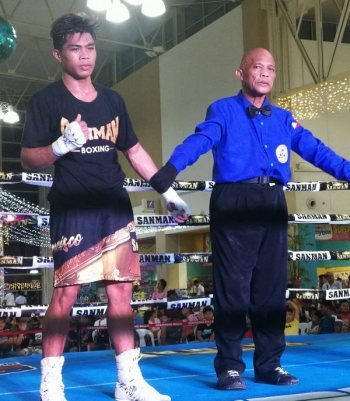 Rolando Servania - who now stays and trains in Gensan - is handled by Sanman Boxing Promotions, while elder brother Genesis trains in Bacolod City. In the co-main feature, unbeaten Omega Gym featherweight Tomjune "The War Dog" Mangubat (10-0-1, 9 KO's) and tough Venson "The Notorious" Delopere (6-3-4, 2 KO's) of the Dino Olivetti Stable in Biñan, Laguna, fought to a 10 round split decision draw. The taller Mangubat, 21, used of his longer reach and good boxing at a distance while Delopere, who hails from Camerines Sur, pressed for the fight in the inside. Both boxers displayed excellent conditioning for the fast-paced combat handled by referee Rodolfo Hospital. "The War Dog" Mangubat was helped in his red corner by his unbeaten Omega Gym stablemate and friend Christian Araneta (16-0, 14 KO's). Jerry Francisco (L) overpowered Ryan Makiputin. In another entertaining clash, unbeaten Gensan 108-pounder Jerry Francisco (6-0, 2 KO's) in the red corner overpowered underdog Ryan Makiputin (13-15-2, 4 KO's) of Bukidnon via TKO in the third stanza. Francisco, 21, proved to be the superior fighter, scoring a variety of hard blows that quickly reduced the stamina of the man in the blue sulok. Official time of stoppage was 2:53 mark in chapter three. The third man was again master referee Alberto Hiramil. Also, undefeated lanky Sanman super flyweight Judy Flores (6-0, 2 KO's) outclassed rough Sarangani native Ramel Antaran (3-12-1, 0 KO's), landing on him hard and continuously, forcing Antaran, 22, to abandon the combat during the minute rest for the fifth round. Judy Flores wins by stoppage. The referee Teodoro Denonong of Davao waived Antaran off, awarding the win by stoppage in round 5 to Judy Flores. With the rather easy triumph, the taller Judy Flores, 20, presses his boxing career forward, willing to take tougher challenges in the highly competitive super flyweight division. In more action, unbeaten light flyweight Mark "Thunder" Vicelles (9-0-1, 5 KO's) wearing the yellow trunks of the Omega Team of Cebu City scored a unanimous decision win in eight rounds over unheralded 25 year-old brawler Lyster Jun Pronco (9-18-2, 6 KO's) of Bukidnon. The clash had its share of unintentional headbutts reflected on the face of the boxers at the end of the rough ride. Once the rumble was done, the third man Alberto Heramil raised the hand of the 22 year-old Omega Gym southpaw Mark Vicelles. Born in Sultan Kudarat, Vicelles currently stays and trains in the Queen City of the South, Cebu City. Furthermore, veteran super flyweight fighter Raymond "Tornado" Tabugon (21-9-1, 11 KO's) of the Sanman Boxing Stable had no trouble in viciously knocking out heavier, less talented 30 year-old Alvin Blais (15-14-1 4 KO's) of Surallah in Cotabato del Sur. A barrage of unanswered blows in the second chapter forced the demise of Blais, prompting referee Rodolfo Hospital to waive the combat off at the 48 second mark in stanza number two. The tough defeat was the eight consecutive setback for Blais who has been knocked out thirteen times in his difficult fighting career. Shall the brave Alvin Blais continue taking more risks in rough sport of boxing.. or his health is more important? In a quick rumble, undefeated super bantamweight Stephen Bontoyan (4-0, 2 KO's) fighting out of the red corner needed only 91 seconds in the opening round to search and destroy Sarangani boxer Carlito "Jun" Antaran (2-4-1, 1 KO) who had no resources to counter the furious attacks sent at him by the tough Bontoyan. 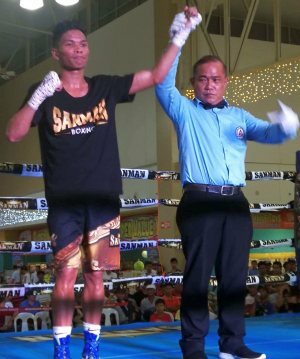 Also, young Flyweight Wendell Plania (1-0-1, 0 KO's) of the Sanman Boxing Stable escaped with a split draw in his clash against Sarangani southpaw Jovab Lucas (3-1-1, 1 KO). In a 4-rounder action, Light Flyweight fighter Ruel Julian (1-1, 0 KO's) of Bukidnon scored a close, hard-fought win by points over lanky 19-year-old debutant Dariel Diamante. And in the first bout of the show, debutant Featherweight Michael Cassama stepped-in into pro boxing with a spectacular round one knock out win over Rey John "Jadry" Indita (1-6-1, 1 KO's). In attendance during the thrilling show was Nonito Donaire Sr, father of bantamweight world champion Nonito Donaire Jr. A coach and veteran man of boxing, Donaire Sr. has just opened his own American cuisine restaurant in the heart of Gensan. The exciting card Sunday (Nov 25) at Robinsons Place Gensan was a production of Award Winning promoter Jim Claude "JC" Manangquil and boxing promotion partner Dexter T. Tan of Sanman Boxing in cooperation with Jerome Calatrava, the Vice President of the Omega Gym of Cebu. Billed as "Brawl at the Mall: Magic Night" the boxing event was a knockout win for the organizers, with fans wanting more. The Games and Amusement Office (GAB) officials in charge were Databuffah Yasser A. Sinsuat and John Kenneth Improso. The ring physician was Dr. Carlos Clemente III. Ring announcer Bonnie Templonuevo. GAB Timekeeper Rosendo Garcila Jr.
GAB Judges were Brembot Dulalas, Romeo Fordaliza and Marlou Neri III; and the third men in the ring were Alberto Heramil, Rodolfo Hospital and Teodoro Denonong. The author Carlos Costa is a Panama-born veteran man of boxing living permanent in Cebu. He attended this boxing show at Robinsons Place Gensan. Carlos can be reached by email: Carlos512@hotmail.com and Whatsapp +639184528152.